Tell a Story. Be Yourself. Take Risks. The Culinary Business. The way I get myself over the loss of something… in this case, the warm, comforting embrace of Summer… is to consider what I am looking forward to next. Chilly days and cozy nights, pumpkins and squash, and the beautiful deep colors of the falling leaves that are echoed in the change in my wardrobe. Lush sweaters, leather jackets, textured cords, hats, knits, scarfs and my favorite of all, boots!! You never see me procrastinating to pull out the sweaters or prepare the house for fall. The time for reflecting on the year and gearing up for a strong finish does not escape me. On a cool Thursday night, after weighing our dining options, my mom and I slide into one of the wooden banquettes of the local Italian eatery Pizza Antica. A generous bowl of warm, salted focaccia with rich olive oil is set on our table as we relax into our booth and peruse the menu. When I came across the warm Brussels sprout salad I didn’t need to keep reading. With the onset of cool, autumn weather brings us Brussels sprouts at the peak of their growing season. By the end of summer I’m anxious to dig into fall’s harvest and at farmer’s markets the landscape shifts to display a new array of deep reds, yellows and creamy whites. Gone are the strawberries, corn and stone fruits of summer; in their place, root vegetables, squash and cold-weather tree fruit emerge. It’s an exciting time of transition, and also a delicious one. This salad is a celebration of fall and combines all that is good in the world – bacon, Brussels spouts, garlic and homemade croutons for a variety of flavors and textures. The nutty flavor of the pan-fried sprouts is complemented beautifully by the smoky bacon, creamy egg and chew of the toasted bread. Everything is brought together with a light, garlic vinaigrette which compliments the tender sprouts without overwhelming the dish. This recipe was inspired by Pizza Antica, and I encourage you to adapt it as you go. Sometimes I throw in some toasted almonds for crunch or top it with finely grated Parmesan cheese. First we’ll make the vinaigrette and set it aside for later. To make the vinaigrette, soak the garlic, shallots, and thyme in vinegar for roughly 45 minutes. After soaking, slowly whisk in the oil. Season to taste with salt and pepper and reserve covered. Preheat oven to 300°F for the croutons. Toss cubed bread with light extra-virgin olive oil and toast in the oven for 20-25 mins until golden brown and crispy. Allow to cool to room temperature and set aside. Cut bacon into 1/2″ squares and cook over low to medium heat until almost crisp; drain off the fat and set aside. In the same pan you cooked the bacon, heat 2 tbsp. light extra-virgin olive oil. If you have some remaining bacon fat leave it in the pan and just add any extra oil as needed. The extra light olive oil has a higher smoking point so if you don’t have it, replace it with canola oil. Sauté sliced onions over medium-high heat until golden brown, two minutes before you remove it from the heat add the garlic; drain and set aside. In a small saucepan, cover the eggs with cold water and bring to a low boil. Once boiling remove from heat and cover. Let the eggs stand in hot water for 8-9 minutes. Then run cold water over eggs to stop the cooking – this will give you hard-boiled eggs with a firm yolk. Peel eggs and dice finely (about the size of a small pea) and reserve covered in the refrigerator. Clean the sprouts by removing the first few dark leaves and discarding. Cut off the stem, and separate the leaves one by one. When you get to the light green center and can’t pull off the leaves, either slice the heart very thin or reserve for other uses. Peeling the leaves is definitely the best way to make this salad, but if you are short on time you can also shred them in a Cuisinart. It will save you at least 30 mins but you won’t get the same texture. In a large sauté pan, heat remaining extra-virgin olive oil until almost smoking and add sprouts leaves; toss until wilted (about 3 minutes), season with salt and pepper. Add reserved onions and bacon and warm until hot. When hot, add vinaigrette and toss to distribute evenly. 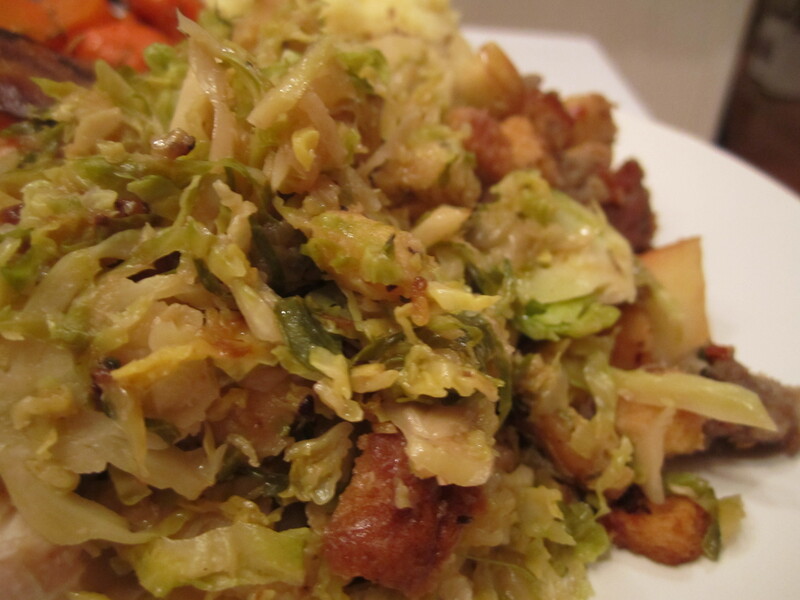 Add croutons and chopped eggs and toss to incorporate. There’s one meal I don’t like to mess with, and that’s Thanksgiving. This is not a place where I tend to experiment. I threw together some fun appetizers, like prosciutto wrapped dates with balsamic glaze, and homemade hummus, but the main meal was pretty traditional. 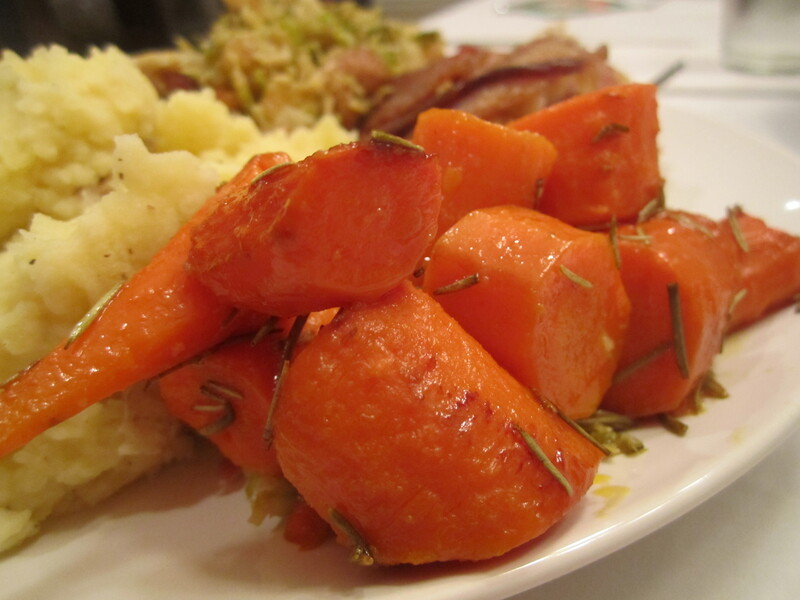 I have the rest of the year to play around and make up new combinations, but on the last Thursday of November I go back to my roots with mashed potatoes, Brussels sprouts, stuffing, gravy, roast carrots, and of course succulent, juicy turkey. I have lots to do on Thanksgiving, so the last thing I want to be doing is mollycoddling my turkey every half hour. Basting, tenting, covering, uncovering. I really don’t have time for that when I’m also trying to get 6 other dishes out at the same time, not to mention trying to be somewhat social while all this goes down. I had many willing helpers in the kitchen, but I wanted people to enjoy themselves and relax so I commandeered the stove and told everyone else to beat it. (With love of course). Here’s my secret ingredient… bacon. Tasty, salty, greasy, crispy, meaty, perfect-with-almost-anything bacon. The turkey doesn’t come out tasting like one big pork rind, rather it’s a natural baster keeping the turkey juicy, tender and amazingly moist. You can leave it alone and let it cook in the oven and you’ll have perfect turkey every time, not to mention some crispy bacon on the side. Who wouldn’t come back to your house for Thanksgiving after serving this?!? Place onions, apple, herbs, garlic and celery inside the bird. Put as much as you can fit inside, and any leftovers just scatter around the pan around the bird. Spread butter all over bird, making sure to put as much of the butter under the skin to keep the breast moist and juicy. You may need more butter depending on the size of the bird, don’t be skimpy! Check bird with a meat thermometer, the turkey needs to reach 160°F, if it goes about 165°F remove immediately or it will start to over cook. No need to cover in water, stock, oil. Just leave it alone. 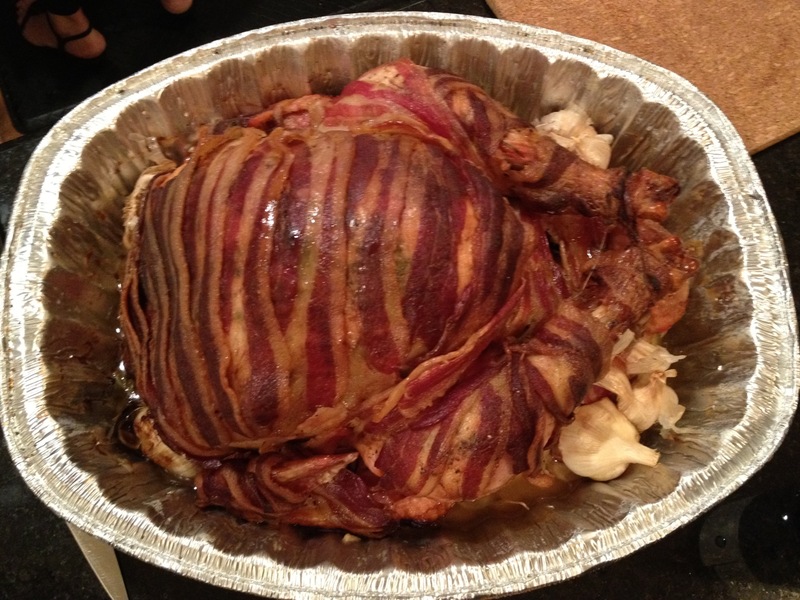 Enjoy the turkey and don’t forget a piece of crispy bacon; there should be plenty for everyone!